Heat oven to 350°F. Brush 1 side of each bread slice with oil. In ungreased 9 1/2-inch deep-dish pie plate, line bottom and side with bread, oil side up and slightly overlapping slices. Bake 5 to 10 minutes or until edges are light golden brown. Meanwhile, in large bowl, gently mix meatballs, bell pepper and onion stir-fry, and pasta sauce to coat. 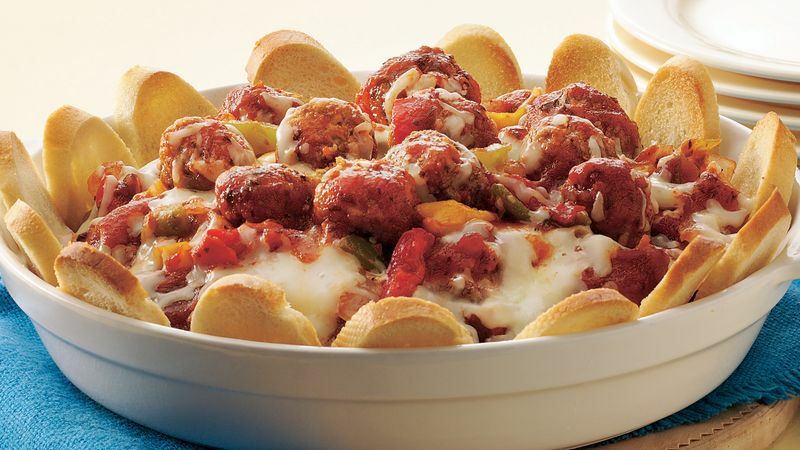 Spoon meatball mixture into crust; bake uncovered 25 to 30 minutes or until thoroughly heated in center. Sprinkle with cheese; bake 5 to 10 minutes longer or until cheese is melted. If the meatballs that you're using are large, just cut each one in half before mixing with the sauce.